The idea of the “icon” is a difficult one to convey in the West, especially now that the word is so widely used in the contexts of technology and the media. Indeed, the word, of Greek origin, simply means “image”, but it brings with it for the Eastern Christian a vast number of associations. 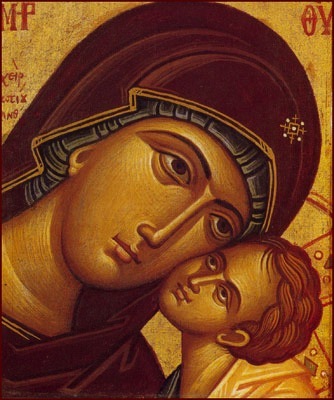 For Christians of the Byzantine rite an icon is more than a religious painting. It is a transmission, here and now, of the prototype of the feast or saint depicted therein. 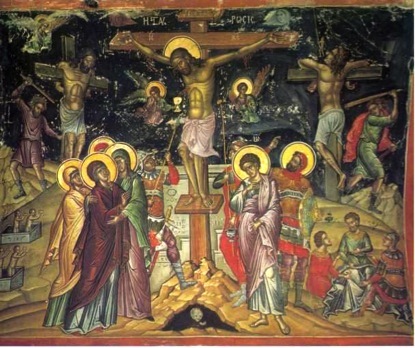 It is also a symbol of the defence of correct doctrine: the Sunday of Orthodoxy, the first Sunday of Lent, is the proclamation of the restoration of the icons after the defeat of iconoclasm (the destruction of images). It is a theological matter: the reason that Christ may be depicted in paint is because He became flesh. The understanding of the dual nature of Christ, fully human and fully divine, is essential to any theology of the icon and any understanding of the reasons why painting developed so differently in the East and the West. That Western painting moved in a different direction, then, has traditionally been a difficult point for Eastern Christians to come to terms with. 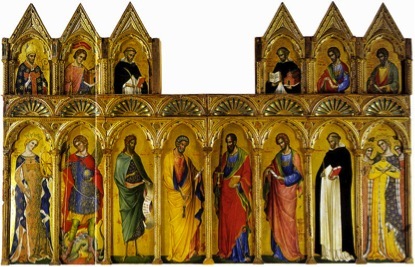 While Western commentary of a general kind has normally begun with Duccio (or, at a push, Cimabue), it has generally been predicated on the idea of the increasing realism of successive generations of artists, so that, while Duccio is a trailblazer in that he began the rush to escape from Byzantine formalism, by the time one arrives at Giotto, the renaissance is fully prefigured and Eastern obscurantism is left behind. When I studied art history at school, I was intrigued by these Eastern obscurantists. I wanted to know why Duccio was represented by only one painting, and why Cimabue was barely mentioned at all. The first four or five pages of the standard texts were full of unresolved mysteries. It took me a long time to make the connection between icons and what I had glimpsed on those four or five pages. As an Orthodox Christian, I venerated icons; they expressed and explicated the hymnography which was being chanted; they incarnated (I use the word advisedly) the feast I had been summoned to help celebrate. As a musician, I sang (and composed) notes appropriate for those explicatory images. As someone who loved painting, I made no connection between Orthodox iconography and western art. 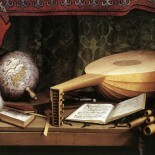 Seeking to integrate theology and art (in my case, music) led me to a point of radical dissociation between East and West, but it was a position lacking an intellectual foundation, in spite of the huge inspiration found in a small number of texts, in particular Philip Sherrard’s work on art and the sacred. While, as a composer, I thought it necessary to assume a radical stance (and still think, in retrospect, that it was good to do so at that time), in reality there was no basis to such a stance other than sectarian polemics. It took many years for me not only to abandon the polemics, but to understand that there were connections between what I loved instinctively and what I knew to be theologically correct. When I read Timothy Hyman’s description of Duccio’s Maestà as an “expanded icon”, I knew that I had stumbled upon a profound truth. The reality was (and is) that, for me, those early Italian paintings were icons. The question is complicated by ritual. Icons simply do not have the same function in the West, and altarpieces and triptychs have no place in the Byzantine rite. One cannot, therefore, search for exact equivalents. But the idea of an “open culture”, in which a broad-based artistic language was common to both sides of the cultural divide, even after the Great Schism of 1054, has been explored by a number of historians in different fields, with results that are only now coming fully to light. It is thus that one may begin to contextualize such things as the collection of highly westernized icons at the Greek Cathedral of St George in Venice, the existence of polyphony in Greece and Cyprus, the travelling back and forth between Eastern and Western spheres of influence of artists such as Paolo Veneziano, and the development of the “baroque” icon in Serbia. The conventional narrative asserts that Orthodox iconography entered into a dismal period at some point after the Fall of Constantinople in 1453: “From about the sixteenth century onwards, the Orthodox icon witnessed a gradual decline, in content as well as in spiritual awareness”. This trend is reversed, the narrative runs, by a rediscovery of a proper understanding of icons, epitomized in the work of Fotis Kontoglou (1895-1965) and Leonid Ouspensky (1902-87). While it will no doubt shock many that Florensky was referring specifically in these comments to Giotto and the development of perspective, it must also be understood that he was writing at a time when the spiritual message of Byzantine icon painting, conveyed in part by the use of what he theorized as “reverse perspective”, was not only misunderstood but despised – as Florensky himself shows by quoting a highly negative assessment of mediaeval painting from Alexandre Benois’s Istoriya zhivopisi (History of Art), published in 1912. Recent research is beginning to re-evaluate the supposed “decline”. The Fifth International Conference on Orthodox Church Music, held earlier this month at the University of Eastern Finland, was dedicated to the theme of icons and music, and communications by Deacon Evan Freeman and Katariina Husso, amongst others, clearly demonstrated that the time for an objective re-examination of this narrative, and of the historical circumstances that created it, has arrived. In the first edition of the Conference, in 2005, Anatoly Grindenko had already put his finger on the problem, asking whether, as a corollary to the revival of monophonic chant taking place in Russia, one should throw out all the “bad” icons which had been used in prayer for centuries. The conflict between East and West had been playing out in Russia for a long time, of course. One might see the rediscovery of chant and the way in which it injected life into the complex polyphony of the “New Trend” (as famously exemplified by Rachmaninov’s All-Night Vigil) as the culminating point of this cultural clash, a truly creative one – a renaissance, in fact. As long ago as 1971, the Orthodox theologian Christos Yannaras had already proposed that in the “westernized” aesthetic of many Russian icons one might discern what he called “a dialogue within the framework of the Western religious stances”, but that, at the same time, “the icon expresses precisely the distinctiveness of the dialectical character of Russian theology with respect to the West.” I would argue that if one has what Florensky called “the certainty of theocentrism”, icons may expand, truth may be well served, and dialogue may begin. Ivan Moody is a composer and Orthodox priest, and Professor of Orthodox Church Music at the University of Eastern Finland. Interestingly, Hugh Honour and John Fleming do place Cimabue in context, even reproducing the Madonna enthroned, while pointing out the insubstantiality of his reputation, and Duccio is examined through the unexpected prism of the Passion scenes from the back of the Maestà. See Honour & Fleming, A World History of Art, London: MacMillan 1982, 303-305. Timothy Hyman, Sienese Painting, London: Thames & Hudson 2003, 17. It is important, once again, to note that the Great Schism was not a single event, but a process that took place over many years. See Kazanaki-Lampa, Maria, Ὀδιγὸς τοῦ Μουσεῖου, Ἐλληνικὸ Ἰνστιτοῦτο Βυζαντινῶν καὶ Μεταβυζαντινῶν Σπουδῶν Βενετὶας, Venice 2005 and Guida al Museo di Icone e alla Chiesa di San Giorgio dei Greci, Venice: Istituto Ellenico di Studi Bizantini e Post-Bizantini di Venezia, 1992. See Francesca Flores d’Arcais and Giovanni Gentili, eds, Il Trecento Adriatico, Paolo Veneziano e la pittura tra l’Oriente e Occidente, Milan: Silvana, 2002. The most comprehensive study of this phenomenon is Dejan Medaković, Serbische Barock, Vienna: Böhlau 1991. Mariamna Fortounatto & Mary B. Cunningham, “Theology of the icon” in Mary B. Cunningham and Elizabeth Theokritoff, eds., The Cambridge Companion to Orthodox Christian Theology, Cambridge: CUP 2008, 146. Pavel Florensky, “Reverse Perspective”, in Pavel Florensky, Beyond Vision. Essays on the Perception of Art, ed. Nicoletta Misler, London: Reaktion Books 2002, 221-2. Anatoly Grindenko, “The Perspectives of Reviving Znamenny Singing in Russia”, in The Traditions of Orthodox Music. Proceedings of the First International Conference on Orthodox Church Music, Joensuu: University of Joensuu/ISOCM 2007, 363–374 (Russian version, 351–362). For a penetrating discussion on the way harmonization was perceived in Russia and the way it was carried out in relation to the nationalist agenda, v. M. Frolova-Walker, Russian Music and Nationalism, New Haven and London: Yale University Press 2007, 265–300. A remarkably concentrated theological and philosophical discussion of Eastern and Western iconography may be found, for example, in Massimo Cacciari, Tre icone, Milan: Adelphi 2007. It is a tradition to paint ” the mother and the son ” by artists of different ages , places , in all styles and schools to depict the savors brief trip to the world . It is a hard to understand the meaning of every ” mother & son ” that interpret the event by painters. This entry was posted on June 20, 2013 by renaissanceartandmusic in Blog Post and tagged art, christian, eastern orthodoxy, iconography, icons, music.